RetailWeek reports (subscription required, via 9 to 5 Mac) on Apple's retail store experience in the wake of the opening of its massive Covent Garden store in London. The report covers a number of details about Apple's retail store history and the Covent Garden store specifically, but also offers some interesting quotes from Apple's Senior Vice President for Retail Ron Johnson about the company's philosophy. Johnson claims that the company embraced the retail store initiative as an opportunity to show off the company's sleek product designs and innovative technology. But even with the company now operating 300 retail stores, Johnson notes that most people still have never touched an iPad. Explaining the stores' appeal he says: "10 years ago, we decided that, as a company that wanted to win in innovation, we wanted customers to experience the product at first hand." That focus led Apple to its retail store concept, where stores function less like traditional shops and more like showrooms where people can play with Apple products as a destination in its own right, with sales taking something of a back seat in the store experience. That meant the creation of a "gold standard" for Apple stores. While many retailers view stores by measures such as square footage and sales, Apple takes a different approach. "Our primary objective is to create a place that people will love," says Johnson. Covent Garden is the most significant iteration yet of that attitude. "We've not only created a store, we've created a place for people to be," he says. 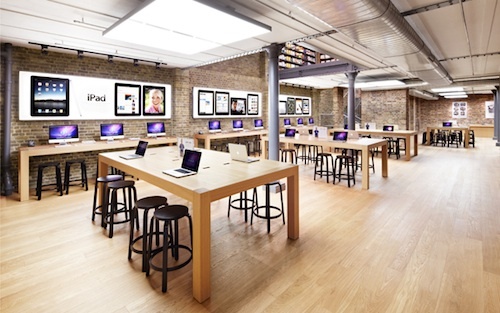 With the fluid staffing and layout of Apple's retail stores, along with new technologies that allow staff members to execute sales from anywhere on the floor, the retail store becomes more about customers coming in to try out products, learning from sales staff, and then ultimately transitioning to sales in many cases. Johnson says high-pressure sales techniques are alien to Apple's philosophy - and, in any case, the enthusiasm for Apple's goods from both customers and staff means there is no need for the hard sell. He says staff are taught "to look in the heart, not the pocket book" when dealing with customers. Staff, he says, are there "to help you buy". Johnson noted last November that Apple was looking to employ a shift in its retail store strategy, looking to open larger stores to handle the increased traffic as the company's popularity has continued to surge while also placing more emphasis on "significant stores" offering iconic presences like the recently-opened Covent Garden and Shanghai stores.